As the lumbering jet swoops low over the grey, legoland housing rows that surround Heathrow Airport, the story of the author’s year of living in England begins. 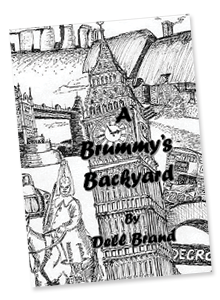 Recipients of a teaching exchange, Australians Dell and John are bound for schools in the West Midlands, and find that things are quite different in Brummyland. Their schools throw up undreamt-of challenges that they must rise to meet but the school year also offers a plethora of breaks in routine and the two find themselves away on weekends and longer trips, exploring parts of England as well as further afield. The book is a collation of short stories linked together into a humorous omnibus. The result is a collection of stories, forty chapters in all. Each chapter is a yarn in itself, with some observations that people planning a trip abroad as well as armchair travellers may enjoy. It is not simply a tourist guide. Each story aims at providing personal observations to enhance the telling. The tale begins with our arrival and goes on to describe our first few weeks in England. Then comes our first trip away, to Egypt. After that, many of the subsequent chapters relate to jaunts in Britain, while others tell of more trips abroad, to Turkey, other parts of Europe, Gran Canaria and Portugal. Finally the trip back to our Great Southland includes a number of chapters on America, before touching down in Fiji and then returning home to Sydney.